I’m sure it won’t come as a surprise to anyone who knows me, but I love keeping an eye out on eBay for cheap-but-useful construction materials for my various projects. Yes, there’s a touch of The Castle about me :-). It was a ramp that went between a wharf and a floating pontoon, with hinges to allow it to follow the pontoon as it rose and fell with the tide (it’s upside down in the photo). 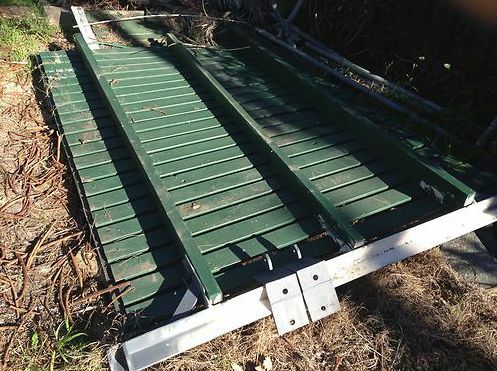 The metal bits are very heavy duty and galvanised (since they were used around water), the bearers are 2×6″ treated pine, and the decking is also treated pine. It’s all put together with screws, so is easy to pull apart. It’s 2.6m long, and almost 2m wide. That’s a lot of useful timber for just $10! I must confess to misreading the listing for this lot. I thought the dog wire rolls were the standard 1.2m high, but they turned out to be 1.8m high! Even better! There were 9 rolls, each about 5-10m long. There was a hefty roll of chicken wire as well. The dog wire will be great to make trellises for growing beans and other climbing plants, and possibly to make a pen for larger animals someday (hopefully for goats!). They’re 42mm diameter galvanised steel tube. 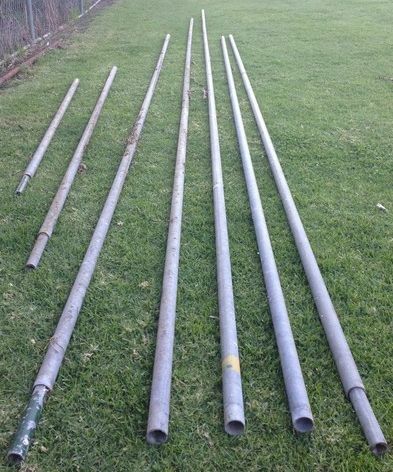 There were four lengths of almost 6m, 1x 5.2m, 2x 3.0m, 1x 2.6m and 1x 2.0m. I had to cut the longer ones down to get them on my trailer, but there are a lot of useful lengths there. 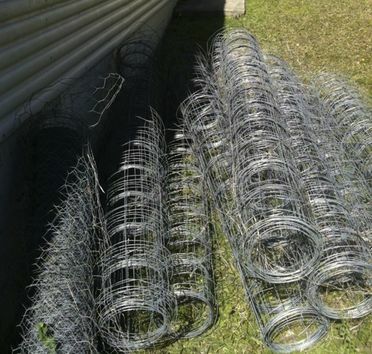 I’m planning to use some as posts for a carport I’m building for my trailer, and the others may get used for chicken pens or something. That’s 37 sheets of roofing iron, in excellent condition. Each sheet is 820mm wide and 3.1m long. 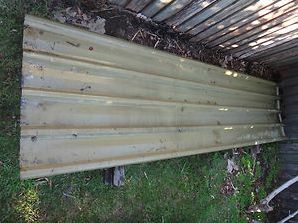 I’ll be using this to build a cover over my shipping container (otherwise rain pools on top, and will eventually rust it out). The roof will be extended by an extra 3m along the side of the shipping container to make the carport I mentioned above. I used a piece as a roof on my rabbit tractor, and there’ll be plenty more left over for animal shelters, chicken pens, wood sheds, etc. One of the best ways to find these sorts of bargains is to set up a saved search on eBay with email notifications. First, do a search for the type of item you’re interested in (e.g. “metal roofing” or “wooden gate” or whatever), then refine it to items within 50 km of your postcode (or less, depending upon how far you’re willing to travel to pick it up). Once you have a list of the current auctions, there’ll be a link up the top to save the search. Click on that, and there’ll be an option to have eBay email you notifications of any new listings that meet your search criteria. You seem to be able to set up as many saved searches as you like, so go crazy! I like to set up notifications well in advance of starting a particular project, so I can collect all the materials I’m going to need. This is especially useful if you want things that don’t get listed very often, like metal roofing or dog wire. Do you have a good eye for a bargain? Do you stockpile “useful stuff” like I do? What’s the best bargain you ever got?